A new Halo arcade game has been announced, developed by American gaming company Raw Thrills. 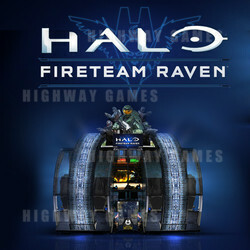 Halo: Fireteam Raven is being aided also in development by Play Mechanix and 343. The announcement comes 17 years after the original single player Halo game was released, and enables four people to play at once. It will originally only be seen at Dave and Buster’s arcades in the US and Canada, with other locations coming towards the end of the year. The per play price within the arcade has not yet been released. The coin operated machine will feature a 130-inch screen, 4K screen and multipurpose machine guns. The game will be set in the same time-frame as the 2001 Halo: Combat Evolved game. Players will also be able to scan a QRC code at the arcade to connect the game with their online Halo identity and verse friends for high scores.